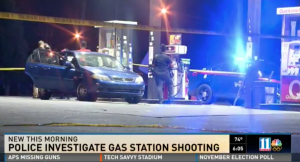 Gas stations are often targets for criminal activity due to (frequently) late hours of operation, accessibility to major roadways, and vulnerable patrons. Given these risks, gas station owners and managers must take steps to protect patrons and deter any foreseeable crime. Has there been prior criminal activity on or near property? If so, what additional security measures could be implemented to reduce such crime on property in the future? Are all security features, such as lighting, fencing and surveillance cameras, in place and working? Is the gas station properly staffed with enough employees to both assist patrons and monitor the property? Is a security guard or off-duty police officer visibly stationed on the premises? Does the gas station provide bright lighting at all service areas? Are the gas pumps, air pressure tanks, and other service areas clearly visible to gas station employees? Do employees utilize a bulletproof pass-through window for late-night cash transactions? Gas station patrons have a right to feel safe and secure while on the premises of the establishment they are visiting. By law, Georgia property owners are required to protect all patrons legally on the premises from any foreseeable harm.